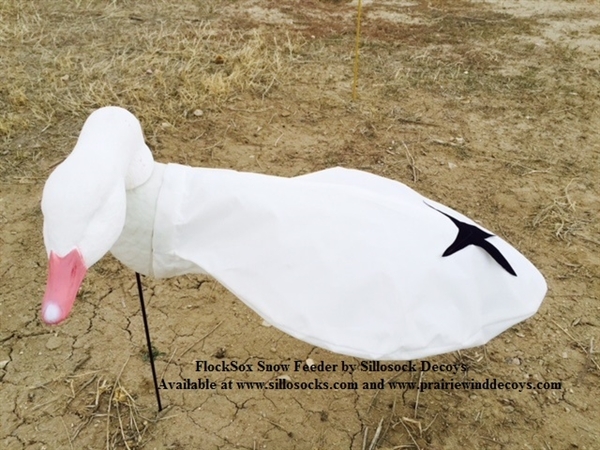 These new Patented FlockSox Snow Goose Decoys are a hybrid windsock/Full Body decoy! They come with Flocked Full Body heads and Full Body chests. 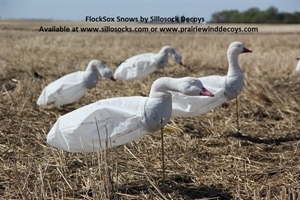 The new velvety windsock body has ultra realistic printing and has the look of a Fully Flocked decoy, yet is super tough! This is a new material that has never been seen in the windsock world. It holds its shape much better than tyvek and is super tough. 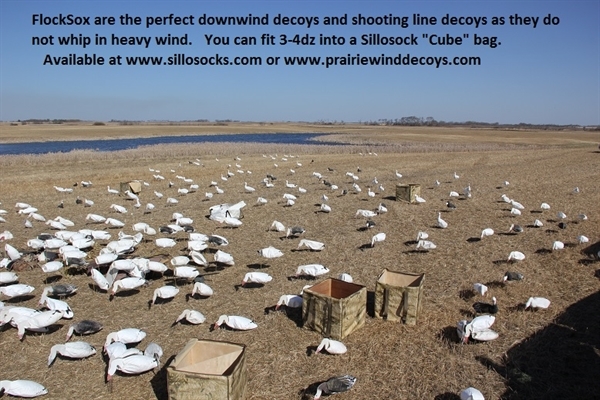 The windsock is held up with a unique patented support system thats folds for storage. 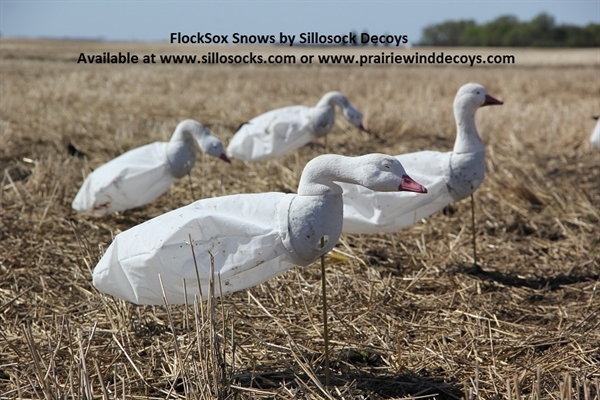 We have been using this folding backbone system in our Sillosock Knockdown windsock decoys for the past 2 years with great success. 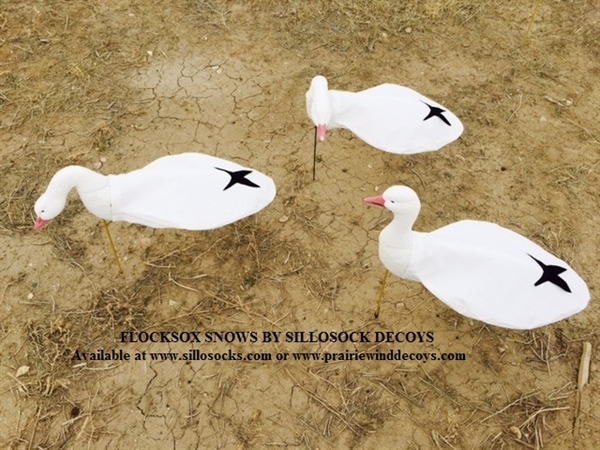 These FlockSox Snow Goose decoys look great in "no wind", and handle high winds much better than any other windsock ever made. 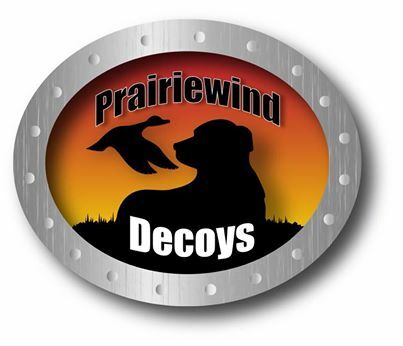 The movement on these decoys is excellent......not to much...not too little. 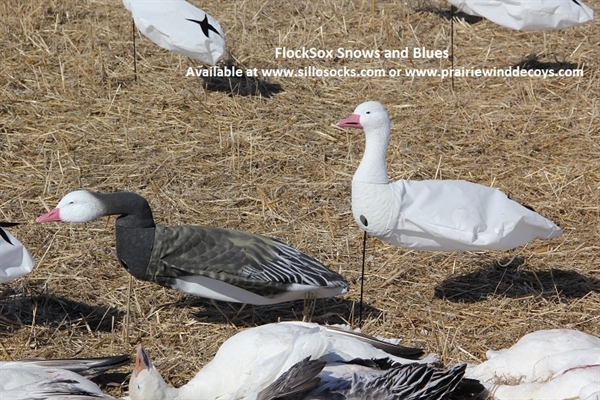 The Black tail feathers on the snows are sewn in. They flap in the wind separately from the body! 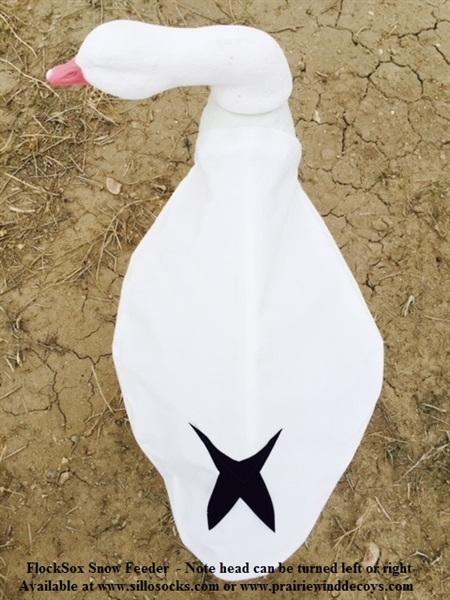 These decoys will help alleviate shine issues with sun, frost, and dew that you get with plastic decoys and silhouettes. These conditions are very common in some areas...especially Canada. 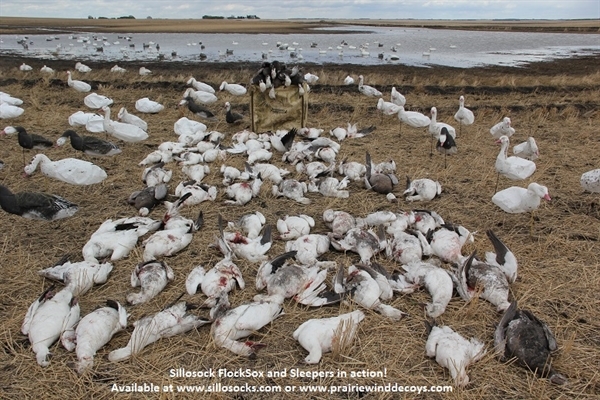 How often have you set up only to have your decoys coated with moisture just before sunrise? 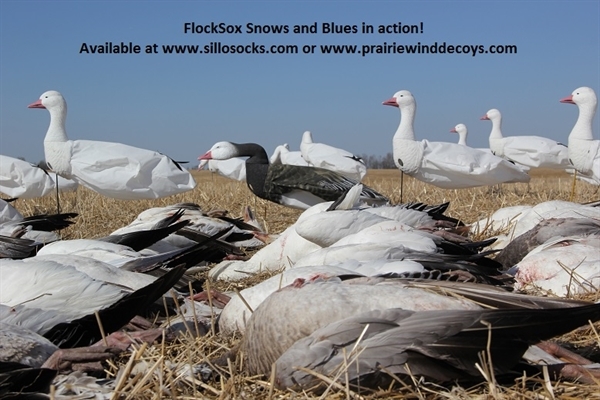 As the sun comes up, your plastic decoys are shining like mirrors and the birds won't even look at you. 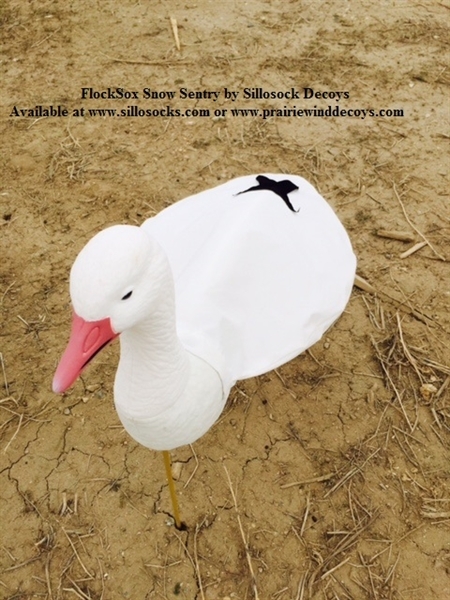 These FlockSox decoys solve that problem. 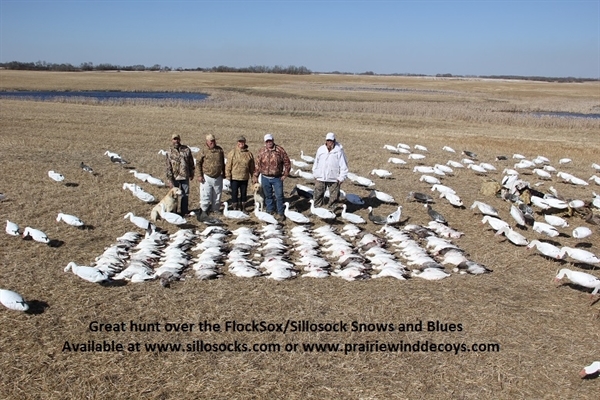 One dozen decoys take up about the same space as 1 Bigfoot Decoy. There are 3 different head styles......Sentry, Searcher, and Feeder in the harvester pack. Stakes can be installed permanently or not. You can store stakes in a 5 gallon bucket if you want. This allows you to have short stakes for dirt/peas/winter wheat. And/or tall stakes for corn/barley/sheet water. 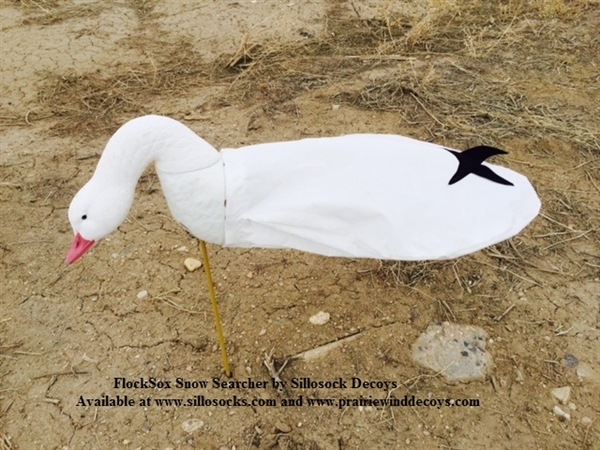 These Flocksox Snow Goose decoys are well made, tough, and extremely portable. The back support folds down for easy storage and transport. Use a Cube bag(sold separately) for small numbers or seed bags for large numbers. A Rubbermaid Tub also works well. Easily installed into hard or frozen ground with a "Sillo-staff" frozen ground punch. **SPRING SALE** Normally $130/dz. ON SALE NOW FOR $59.95/dz.! !